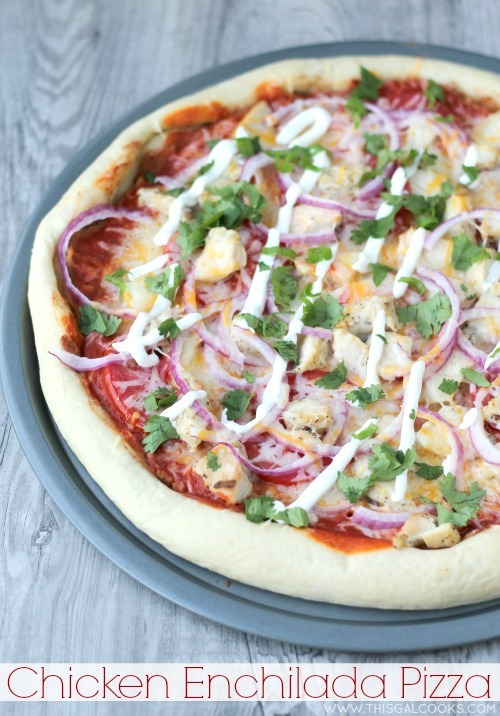 You’re going to love this fantastic, Mexican inspired Chicken Enchilada Pizza. Topped with refried beans, enchilada sauce, cheese, fresh veggies and Tyson® Grilled and Ready® chicken, it’s sure to be a hit with your family! I’m honored to have been selected to try out Tyson® Grilled & Ready® chicken and create a fabulous, healthy recipe with the chicken. One of my favorite types of Mexican food is enchiladas. Soft tortillas filled with meat, spinach or cheese, topped with creamy or red sauce and sprinkled with cheese combine to make one fantastic dish. But enchiladas are typically loaded with fat and calories. They aren’t something that I eat too often. I decided to create a healthier meal that used ingredients common in enchilada recipes but were friendlier to the waistline. Did you know that Tyson® Grilled & Ready® chicken is 98% fat free, contains no preservatives and is fully cooked? Creating simple, healthy recipes becomes a breeze when using Tyson® Grilled & Ready® chicken. See that chicken on the pizza? Doesn’t it look fabulous? That’s healthy Tyson® Grilled & Ready® chicken. See all of those fresh veggies? Those are healthy too. This pizza is low in fat and low in calories. In fact, there is only a total of one cup of cheese on this pizza! You won’t find that with your typical enchilada or slice of pizza. So head on down to your grocery store. Pick up some healthy . Pick up the other ingredients listed below. Make this delicious pizza. Make it now! It will satisfy your Mexican food cravings without upsetting your waistline! Roll out the pizza dough until it is thin and round. Place it on a round pizza pan and form the crust. Bake at 350 for about 10 minutes. Remove the pizza crust from the oven. Spread the refried beans over the crust and then spread the enchilada sauce over the beans. Sprinkle ½ C of the cheese over the sauce. 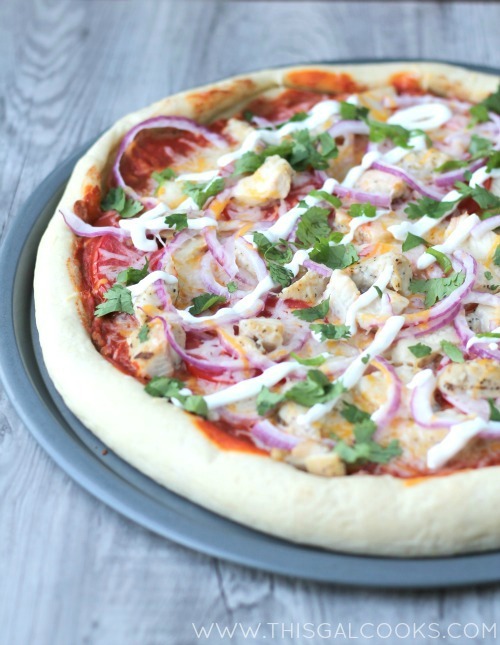 Top with the tomato, chicken and red onion. Sprinkle the remaining cheese over the chicken and veggie toppings. Bake at 350 for 20-25 minutes or until the crust is slightly golden. Remove from the oven and drizzle with the sour cream. I put the sour cream in a plastic storage bag, cut off a small corner and squeezed it over the pizza. Top with the cilantro and green onion. 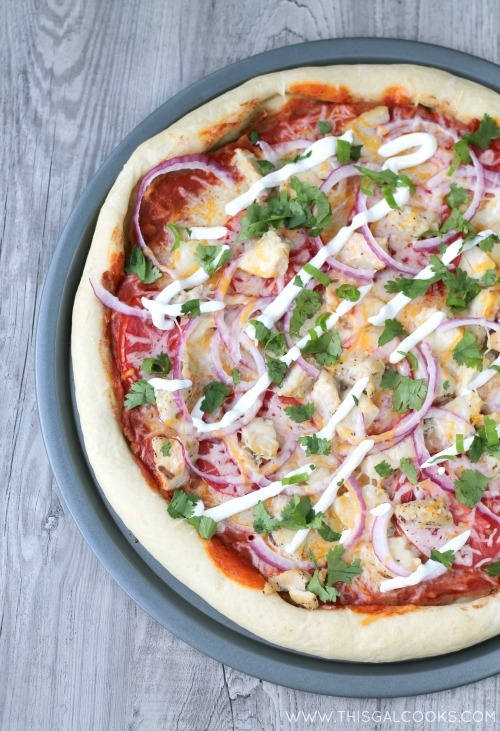 Now that you’ve seen this delicious Chicken Enchilada Pizza recipe, why not check out some more great recipes made with Tyson® Grilled & Ready® chicken? Find more delicious recipes at the Tyson website right here. Get on the road to a healthier you! Visit Tyson® Grilled & Ready® on Facebook to enter the 100 Days Until Summer Countdown/Countdown to a Better You program! I wrote this post while participating in a blog tour conducted by Burst Media. I have been compensated for my time commitment to the program, but my opinions are my own. Thank you, Gloria! I will definitely be making this pizza again. It was so good! You know I love exciting, new pizzas, and this one looks extra good. Great recipe, Julie! Thank you, Andi! This one is super duper good! This looks delish and healthy-what more could we ask for! I know, right?! See, pizza and enchiladas can be healthy! Thank you, Nicole! This pizza is definitely on my list to make again. It’s SO good! This looks great!!! I’ll have to give it a try…how creative! Awesome! 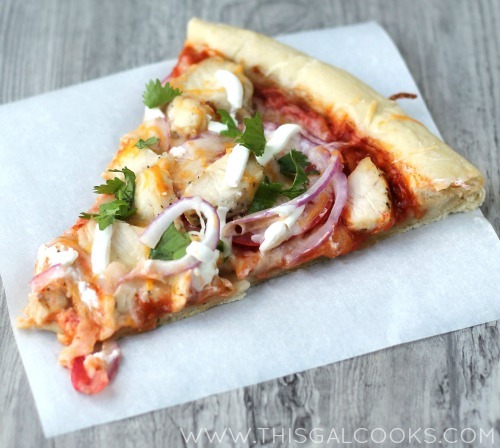 Pizza and enchiladas are such a great idea! Thank you, Carrie! This one was definitely a winner! This is so easy to make and looks delicious! I love Enchilada but I’ve never tried Enchilada pizza before. I’m VERY intrigued! That was really a smart idea to turn a pizza into an enchilada. It gets the best of both worlds this way! Delicious food, but still healthy! It’s SO good! You will love it! Yum, yum!! Featuring this tonight at 8PM at my “Best Of The Weekend” party. Thanks for linking up!